By the simple expedient of adding a washer or washer assembly to a machine screw (retained by post rolling of the screw thread) SEMs offer significant time and cost savings in the production environment while ensuring washers do not get lost or forgotten. Typical formats include pan head or flange head with cross recess, hex or multi-splined (star) drives assembled with a single conventional washer or a combination of washers, e.g. 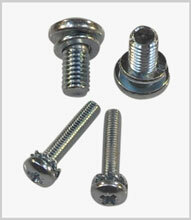 flat washer/spring washer, flat washer/internal toothed washer, flat washer/external toothed washer, etc.